This ingredient is a great addition to your barbecue marinades and rubs, just pound it up with a mortar and pestle and add it to other spices. A key ingredient in what the Prime Minister of Thailand calls "Thai MSG" (see our report of meeting Samak in person at his cooking show, the celebrity chef who became Prime Minister). We often use this "Thai msg" in soup and marinades. In a mortar and pestle pound the above three ingredients into a paste. It's also one of the key ingredients in Chinese 5 Spice. 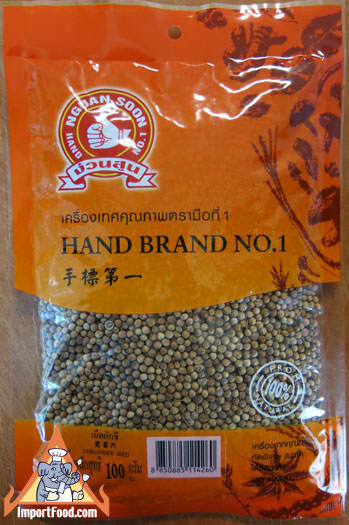 Coriander seed is used in our popular recipe for dry friend chicken Hat Yai style. Product of Thailand. We also offer corriander seed powder.